Hijama has been used for over 5,000 years throughout the world. It is now one of the most talked about therapies in the industry. Most importantly, people are seeing its amazing results for nearly every ailment. It is also a powerful natural preventative alternative. If you are already a practitioner, you are now in a position to learn how to do exclusive treatments and be ahead of your competitors. 2 History of Hijama and ancient healing methods. 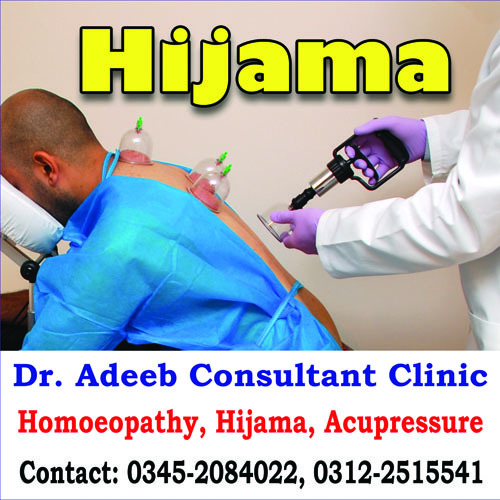 3.Hijama throughout the world, up to the present day. 9.Understanding the anatomy of the body, including meridian points. 11.Understanding health, disease and causes of ill-health. 12.Hijama, detoxification and the immune system. 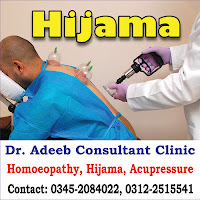 13.Hijama and other alternative therapies. 16.How to diagnose, make case studies and treatment plans. 17.When and when not to treat, whom and whom not to treat. 18.Treatment techniques, health and safety. Our thanks to Dr Adeeb Consultant Clinic from Karachi, Pakistan for sharing the above post. If you have any questions or want to leave some feedback for them, then please do so via a comment* below.